Based on a classical Chinese folk tale, Legend of the White Snake Lady is a 5 reel, 243 ways to win video slot powered by Yggdrasil Gaming. Beautifully designed as always, it comes with re-spins with frozen wilds and impressive jackpot payouts that can top 25,000 coins. Stakes range from between 25p and £125 per spin. The visuals in Legend of the White Snake Lady are as high end as we’ve come to expect from Yggdrasil Gaming titles. Set against a watery blue backdrop, the reels are flanked by a pair of impressive looking dragons. Symbols on show include pagodas and temples, a baby in a lotus flower, a beggar, a woman and a wise old man. Unusually, all of the symbols above offer payouts of 2,500 coins if you manage to land a 5 symbol combination. It’s worth noting here that winning combinations are created when symbols land on adjacent reels rather than in traditional paylines. Landing multiple symbols on the same reel multiplies the payout. The White Snake Lady is by far the most rewarding symbol – land 5 and you’ll bag a whopping payout of some 25,000 coins. If you land 5 with a wild, the payout is a still none too shabby 2,500 coins. The game also comes with a wild which is key to unlocking the only feature on offer. Whenever a wild lands, you’ll always be given a re-spin with the wild locked in place. It’s possible to land 3 wilds in stacked formation. If that happens, you’ll also get a re-spin with the stacked wild in place. The wild can only hit on the middle reel. The volatility here is surprisingly high. This game can deliver some very impressive results amongst the undoubted lean spells. If you like slots with a great variety of features, then Legend of the White Snake Lady probably won’t be one for you. The only extra on offer is after all, the re-spin with frozen wilds. It’s superbly designed though with lush graphics and a haunting soundtrack. The Chinese-themed slot is among the most popular with developers. 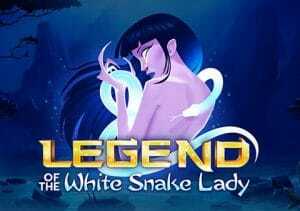 If you enjoy the genre and want a beautiful, simple to play slot that can still pack a winning punch, then Legend of the White Snake Lady is worth considering. If you want free spins and other features, Yggdrasil Gaming’s Chibeasties is a great choice.